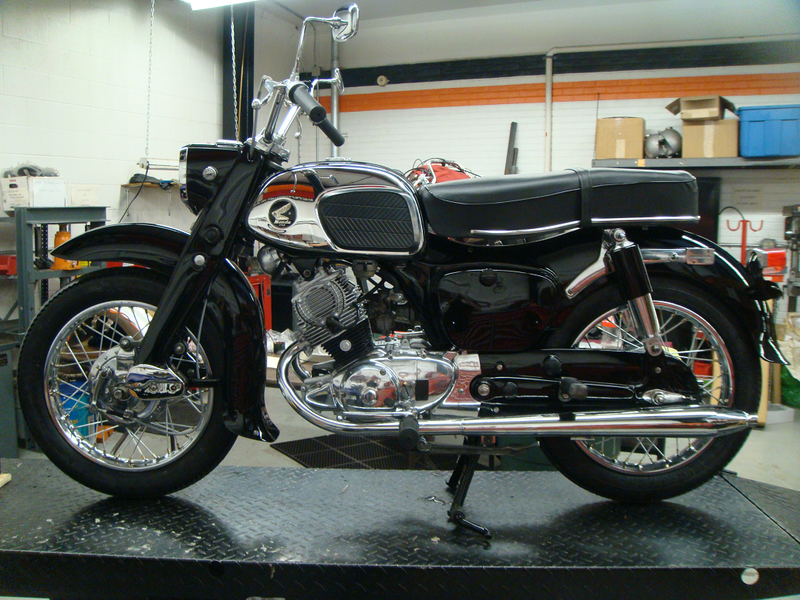 Doc’s Motorcycle Parts is proud to have completed our restoration project on this 1963 Honda Dream 150 CA95. 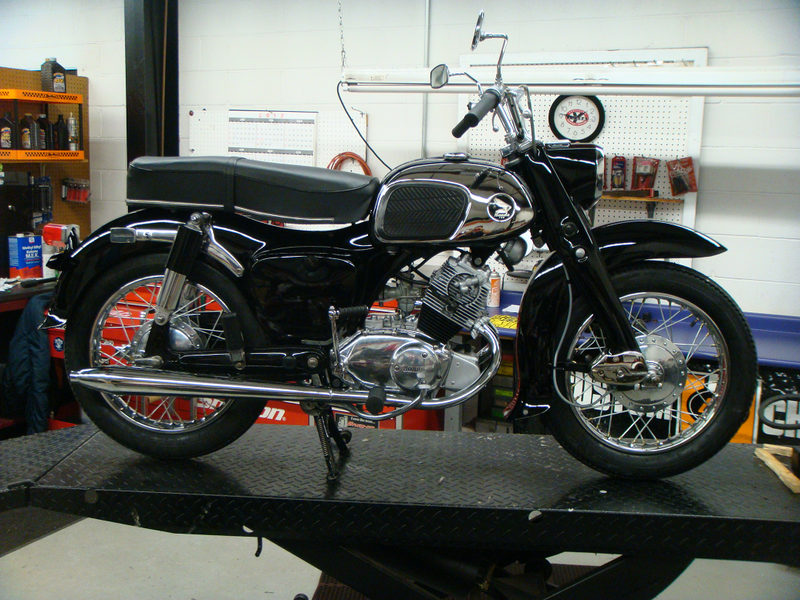 Thats right, Doc’s Motorcycle Parts was chosen by to do this restoration project for one of our customers and it came out great! Of course we tried to keep it as original as possible, many of the same original oem honda parts where found, re-used, re-chromed, polished, cleaned up, you name it to keep this Baby just as it would have been off the show room floor. After searching for parts, and approx 30hrs of labor time, the end result has made everyone very excited and extremely happy with the outcome… The Honda Dream came with white wall tires which we for time reasons needed to go with black walls, but once we get those white wall tires in that have been on back order for 5 months now, we can get this Baby true to its birth. NOTE: The CA95 Benly Touring 150 (early model) was sometimes referred to as the Baby Dream and came in one of four colors: Black, Scarlet Red, Blue, or White. The headlight was square with an integrated speedometer. The fuel tank had small rubber knee pads and a large chrome panel. It can be distinguished from the later model by a short rear fender brace. It also had an enclosed drive chain. The taillight was small and this model came with blackwall tires and flat style mufflers. The engine was an OHC parallel twin displacing 154cc with a single carburetor and the engine was linked to a 4-speed transmission. Unlike later twins, the cam chain came up the left side of the cylinders. I am trying to restore my mothers bike. Where did you find a battery? We just used a 6n12a-2d BikeMaster Battery…if you like we can get you one. Any apolstery shop can re-aposter the seat. Plus I believe there are aftermarket covers, and worst case scenario, aftermarket seats being sold. (not too mention I have an OEM one) As for parts… about 85% are attainable through aftermarket and through searching for parts that are OEM (like on eBay, forums, so on). Any questions just shoot email, or post here. Love the tires – do you have a good source? What size did you use? Allen, the tires we get. The size is 325X16. The pictures where taken right after completion and we decided to throw on the black walls as the white walls where on back-order. Since we have received the white walls as the bike originally had. I have a 66 150 I need to replace the tires, the ones on it now are oshtu 3.00 16 but I can’t seem to find an equivalent will the 325 16’s work? where did you buy all of your parts? We have a 1963 150 Baby Dream that does not have rear view mirrors. I have looked all over to try and source the clutch/brake handlebar mount that also has the mount for mirrors. I have looked on Ebay extensively, but can’t find any. Any suggestions? Your restored bike looks great! Very hard for us to find. There are many replica and aftermarket ones you can get but they are not exactly the same as the originals. The ones on the bike where in pretty decent shape so we where able to clean up real good and re-use. 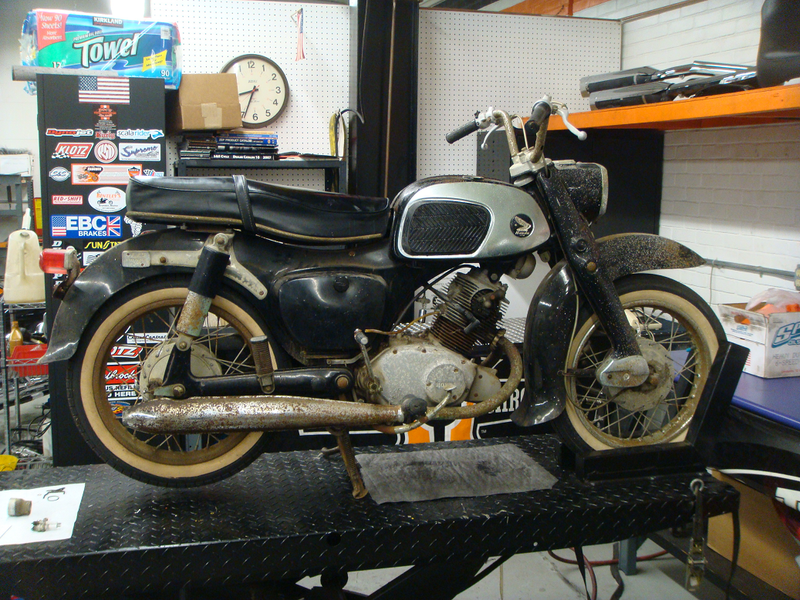 We’re looking for a fuel pump for our 63 Honda Dream 150. Let me know if anyone has a lead on such a part. what size chain is on the 1963 150 baby dream? Have a ’66 Honda Dream that my dad gave me in ’67. I’m rebuilding the engine and am having trouble finding suitable seals and other rubber parts. Are there any specific sources for original reproduction engine seals? Any equivalent parts with same specifications available through a bearing supply source? Do you have a list of the O.D. and I.D. measurements for outsourcing the engine and transmission rubber parts/seals? Unforetunatley with some restorations it boils down to search, search and more searching for parts. Be it ebay, salvage yards, so on. We lucked out with the fact that our motor was (aside from looks) in great shape. No motor work needed. Love that bike that my hopeful ending i found a dream 150 on craigslist with out the seat battery or carb for 250 does this sound good is the carb easily replaced.? and why didnt you go with replacement white walls is there any avibility problem or was that just personal choice? We put black walls on because white walls where on back-order forever. They came in and we swapped out for customer quick. And it turn over with no fire do you think this will be a easy repair? With ours the rubber pads are attached to a lip or channel on the tank. They pull off, then you put back on by re-attaching the rubber pad back onto the channel/lips. Have a 1965 Honda 150 it was in storage scents 1968 it has 104 Miles shown white white wall tires. Look almost new. Cleaning gas tank and fuel lines . every bthimg looks OK when drained the oil on the stand ever thing seems OK . got the second battery. First one got of eBay was no good had a big hole in it the guy that sold it is a big joke ordered this one its just like the old one but can’t get it to put out juice gone go down the wiring today. What pipes did you use for the exhaust? 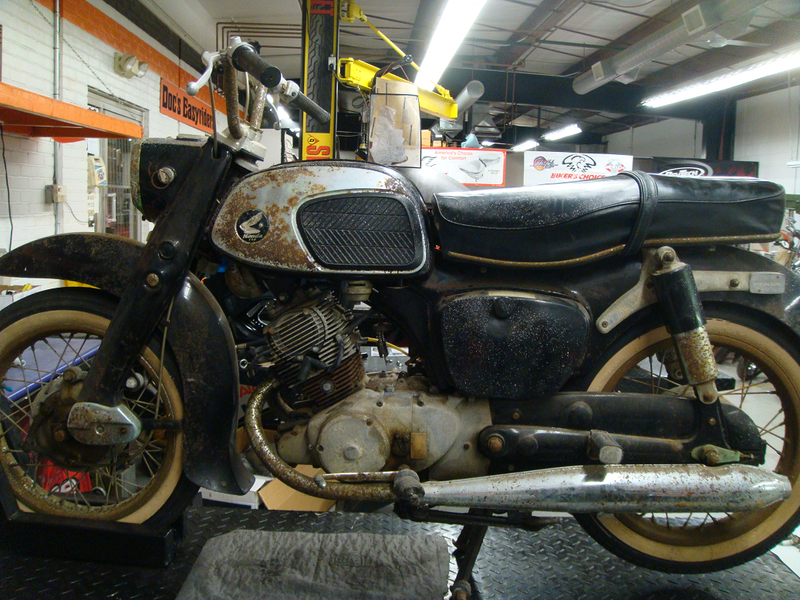 trying to restore a 1963 Honda 150 Dream. However I can not, for the life of me, find an ignition switch w/key . any ideas or sources? ebay had ignition switches but no keys. To make it even better, the switches numbers were so scratched up, finding replacement keys is not happening. Best bet may be to get ignition switch on ebay and have a good local lock-smith make a key for it.